Leek seedlings growing in an outdoor nursery bed. Our late afternoon transplanting shifts with just four experienced people have been proving so successful that we decided to continue for another week and get our leeks transplanted in that time slot. Previously we have transplanted them in the mornings, on our regular shifts, using the logic that the leeks have narrow leaves that don’t lose water quickly, and we are planting deep in holes, where they will stay cool and damp. Leeks are slow growing, but easy to care for and frost tolerant.The ideal size for transplanting is between a pencil lead and a pencil in thickness. We plant at 6” (15 cm) spacing, with 4 rows to a 48” (1.2 m) bed. Before 2013, we sowed all our leek seedlings in an outdoor nursery bed, and transplanted the leeks as bare root starts. It worked fine if we had a relatively weed-free nursery bed, but was troublesome if we got a lot of weeds. We like the ease of having the seedlings outdoors – less congestion in the greenhouse and cold frames, one thing less to hand-water multiple times a day. Last year we had a late wet spring and didn’t have the nursery bed ready, so we decided to sow in open flats, and it worked well. This switch was helped by deciding to cut celeriac and kohlrabi from our repertoire, freeing up lots of cold-frame space. We decided to repeat that method this year, and it looks like it is the way of our future. We use a special planting technique, in order to develop long white shanks, which are prized more than the equally edible green parts. We find it efficient to divide the crew up and specialize in one part of the job. First, if the soil is dry, water it well, preferably more than an hour ahead. Then one person makes parallel V-shaped furrows, 3” (8 cm) deep, along the bed. Next, a couple of people make holes 6” (15 cm) apart in the furrows. Tools for leek planting are called “dibbles” or dibblers, purpose-bought or homemade from broken digging fork handles, with the end sharpened to a point. The tool needs to have a diameter of 1½-2” (4-5 cm). The depth of the holes is determined by the height of the transplants. It’s likely to need to be 3”(8 cm) or more. If the holes cave in, you need to water the soil more before proceeding. Meanwhile another person digs up some of the transplants from the nursery bed or one of the open flats and transfers them to a small bucket containing an inch or so of water. We make useful little buckets from 1 gallon plastic jugs with the top cut off. A rope handle knotted into holes at the top of the new bucket make it easy to carry. Resist any temptation to trim either the roots or the tops of the leeks. 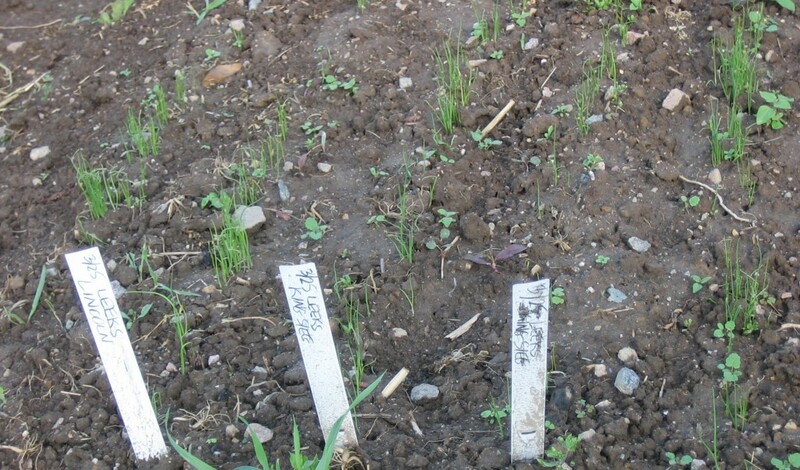 To transplant, take a leek, shake it free from its neighbors, and decide whether to plant it. Discard the ones thinner than pencil leads. If the plant is good size, and looks healthy, twirl it as you lower it into the hole to prevent the roots folding back on the plant, pointing at the sky – they need to grow downwards. This works best if the roots are still wet and muddy from the water bucket. Bobbing the plant up and down as you settle it in the hole will help a transplant that has slightly bunched roots. If at first you don’t succeed, remove the plant from the hole, dip it back in the water and try again. Soon you will develop this quirky planting skill, and will be able to move along the row at a good clip. Ideally the tops of the leaves will poke out of the furrow, not more. Get the depth of the hole-making adjusted to suit the prevailing plant height. This creates the depth for growing a long white shank. Surprising as it may sound, it is not necessary or desirable to fill the holes with soil (you don’t want to bury the seedlings). The soil fills in naturally as the plants become tall enough to survive the depth. Next someone gently waters each hole, either from a low pressure hose or a watering can. The goal is to water the plant roots, not to wash soil into the holes. The shelter of the hole helps the plant get over the transplant shock, and because leeks have slender tough leaves, they do not lose a lot of water by transpiration. This means that transplanting in quite hot weather is possible, as is transplanting in the mornings. Keep the soil damp for several days after planting, and then give 1” (2.5 cm) water per week as needed. Like other alliums, leeks do not compete well with weeds, so cultivate as needed. Some people hill up their leeks, but if you do, be careful not to get soil above the point where the leaves fan out from the stem, or they will be very hard to clean later. So far, we have planted out almost 3 of our 5 hoped-far leek beds. At 90′ x 4 rows x 6″ spacing, that’s a total of 3,600 leeks! Makes winter so much more satisfying! Also this week, we have been hoeing galinsoga everywhere, and sowing sweet corn, our third planting. We like to make furrows by hand, fill them with water, then drop the seed into the mud and cover it, tamping the soil to ensure good contact between seed and soil. We sow several varieties (with different numbers of days to maturity) on the same day, so a planting will give us at least two weeks of delicious corn. 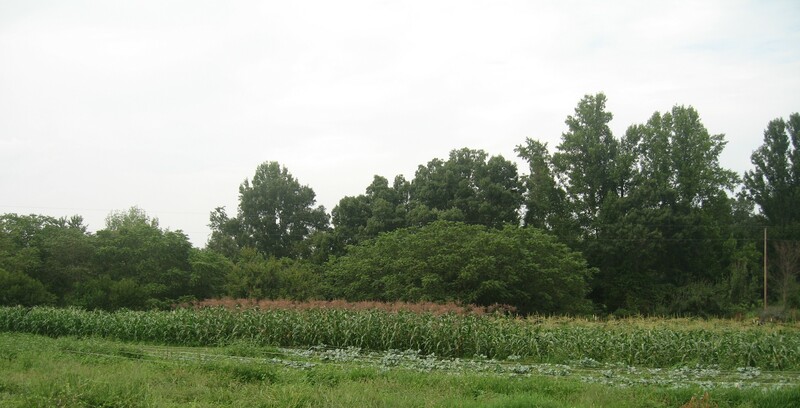 In this photo from a previous year, you can see (from left to right): later-maturing Silver Queen, not yet at full height; red-flowered Kandy Korn; fast-maturing shorter Bodacious. Next Next post: Slideshow on late fall, winter and early spring vegetables; Upcoming events; Know your weeds.